Forget Dante’s Inferno. After having my sweet baby kidnapped and replaced with a toddler months ago, I have now realized toddlerhood has it’s own circles of hell. Forget Happiest Toddler on the Block, I should have read Sun Tzu’s Art of War. No, this is not a blog piece belaboring the point about toddlers being a**holes, because I don’t believe my child is one… okay, fine, at least most of the time. What it is about, however, is now being the parent of a human being who has more feelings and wants than a new diaper and a bottle, but not enough emotional maturity or life experience to understand priorities, logic, or, for the love of God, social embarrassment. Great, now I have to introduce words about bodily functions and appropriate anatomy to my child who repeats absolutely everything, to anyone, at any time. Nope, don’t see any awkward moments on my horizon…ugh. Woohoo! My baby is sleep trained – getting at least 10 hours of restful sleep at night, and mommy and daddy are now rested individuals. Oh wait, now I have to train a human who has the self-control of a gnat to stay in his bed – all night? Two words for you – SOMA bed. For those of you uninitiated, this is used in hospitals for patients who are not able to stay safely in their beds. 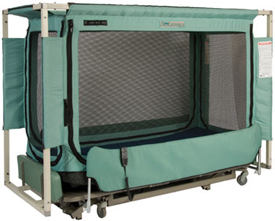 Think a pack-n-play but with a roof :). So, to my coworkers: if you see me rolling one of these babies down the hall, don’t worry, I promise to return it…sometime next year. It didn’t particularly matter before who gave my child his bottle, because bottles are pretty much given the same way by everyone. However, because I really do require a metropolitan city instead of a village to help with childcare, the inconsistencies are becoming glaringly obvious. I am eternally grateful for everyone who pitches in to make our world work. However, my little stinker has quickly figured out how to manipulate each and every one of us. Like, when I come home at night and my child looks like a cocaine addict, with powder all over his face and hands…albeit the powder is orange, instead of white, and came from a half-eaten bag of cheese puffs instead of the leaves of a coca plant. My husband’s response, “well, I asked him what he wanted to eat, and he said cheese puffs.” %#U@$^* Of course he did, he’s 2, and a certifiable cheese puff addict! What did you expect him to ask for?! Green beans? Which leads us to our next circle of hell…. 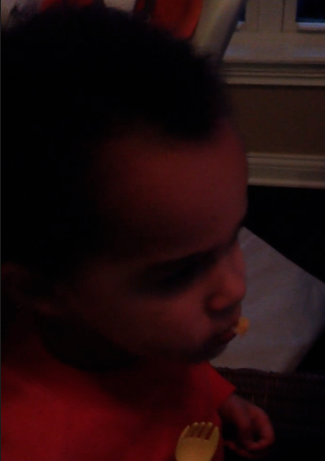 I know it is kind of dark, but this is an image taken from a video of my 2 year old eating mashed potatoes, with corn mixed in. This is photographic evidence of him spitting out each and every individual kernel of corn after every possible molecule of mashed potatoes had been sucked off of them. To all my toddler parents out there – hang in there, my brothers and my sisters in these battles of will. Soon, they will be over… but so will those sweet requests to cuddle and sloppy wet kisses at night. Toddlers truly are Sour Patch Kids, sour and sweet all at the same time. Like it or not, this phase, just like the candy, has an expiration date. This entry was posted in Family, Humor and tagged Art of War, Buddy the Elf, feeding toddlers, Happiest Toddler on the Block, parenting toddlers, potty training, Preschool, Sleep training, SOMA bed, Sour Patch Kids., Sun Tzu, Toddler by surgeoninkicks. Bookmark the permalink. Sally and I laughed through that one!! !